Check out this short video clip.! In it, Panasonic demonstrates the speed and simplicity of using Panasonic's Real Time Express servo communication network to setup up a simple two servo motion demo, from hardware setup to software programming, in 10 minutes. See for yourself how Real Time Express can help you decrease wiring, and save time as opposed to traditional modes of servo communication. It's a big day here at FPE! 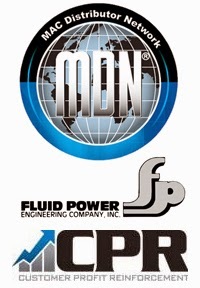 Fluid Power Engineering is very proud to announce that we are, once again, winners of the MAC Valves Distributor of the Month award! In today's information-overloaded world, most accomplishments come and go without much notice. But something like this always makes us stop and appreciate the incredibly talented teams of people that all work together to make successes like these happen. Thanks to everyone who contributed so much time, energy, passion and expertise.